But over the years, we’ve learned that the sale won’t happen without a really happy customer. And in today’s marketplace, customers don’t just want a transaction, they want an experience and a relationship. Not in every case, but in today’s world consumers are discerning. Fortunately for marketers, technology has helped us in our quest to make sure we’re getting the right content to the right audience at the right time. It has helped us focus our efforts, providing our customers with rich experiences online and off. 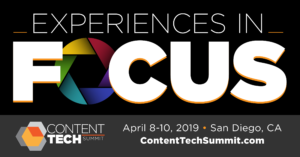 So this year at ContentTECH Summit, our theme is Experiences in Focus. We’ll have some fun playing off the “focus” and will show you some really cool track posters designed by our one-and-only Joseph Kalinowski with a bit of a photography flair. Robert Rose’s opening keynote will hone in on customer experiences, touching on our content management research, and also circle back to marketing technology and its effective use in content marketing. So, stay tuned for more from the Content Marketing Institute and ContentTECH event team as we get closer to the big event happening April 8-10, 2019 in beautiful San Diego, CA. Come for the warm weather, stay for the learning and networking, and return home armed with marketing technology strategies for 2019 and beyond. If you’re not registered for ContentTECH Summit yet, there’s still time! But hurry, early bird rates end on 2/15/19. Plus, use code CTECHBLOG100 to save an additional $100 on your registration.